Phoenix Wright: Ace Attorney Trilogy HD features HD graphics and "fine-tuned" controls. Phoenix Wright: Ace Attorney is currently available on iOS, but while the game's GBA-era sprites look great on the iPhone, they don't hold up quite as well on the larger screen of the iPad. The version collected in Phoenix Wright: Ace Attorney Trilogy HD doesn't necessarily look better, but it does look crisper. The collection was released in Japan back in February and is scheduled for a NA release this Autumn. Phoenix Wright: Ace Attorney Trilogy HD includes the NDS versions of the first three games in the series, complete with "upgraded" HD graphics and "fine-tuned" controls for iOS systems. Each game can be bought separately or as part of a bundle, which should cost around $15 if the pricing of the Japanese version is anything to go by. The first game's first two chapters will be available as a free demo. 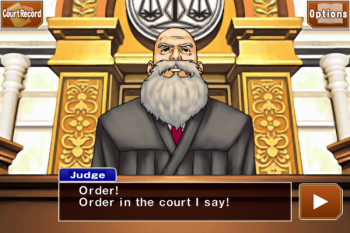 Unlike another NDS game that just got ported to iOS, Ace Attorney Trilogy HD is a universal app. You can judge the game's new HD art style for yourself by taking a look at these screenshots, but purists may find them upsetting. The games seem to have gone through the same trace-over-sprites-with-thicker-lines process that Super Street Fighter II Turbo HD Remix went through, and their clean cell shading has been replaced with the same blur-tool-heavy shading you often see in Sonic the Hedgehog fan art. Unless these screenshots have been hastily resized - which is certainly possible -there's also some heavy duty aliasing going on around the game's line art and text. The games can be played in portrait mode, which offers a simulated two-screen experience similar to that of the NDS releases, or you can turn your iPad sideways, in which case the app will bookend the screen with artwork. The game also includes a new feature called "Everyone Object," which lets you harass your friends via twitter or email by bombarding them with quotes and animated clips from the games.